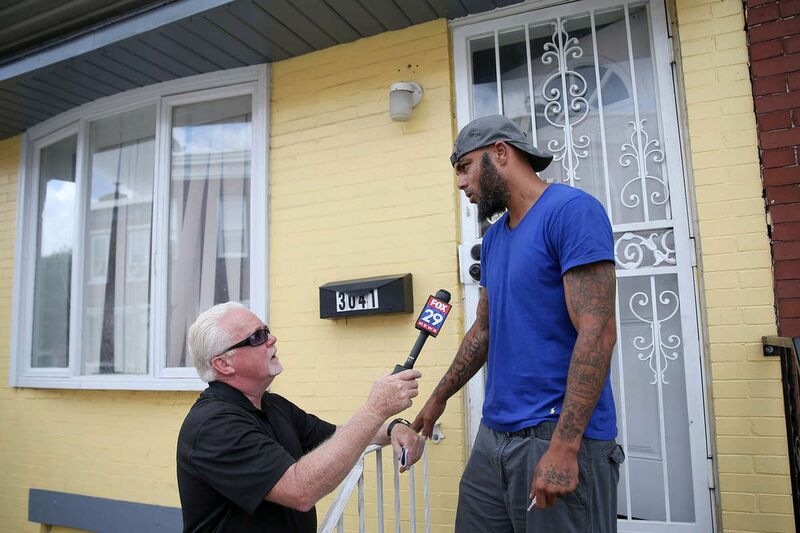 A man who identified himself as a family member, but declined to give his name, briefly talks on Thursday, Aug. 2, 2018, to reporters in front of the Port Richmond rowhouse where pit bulls, police have said, fatally mauled a toddler the day before. A toddler's fatal mauling by pit bulls Wednesday was "a freak accident," a man who described himself as the boy's relative said Thursday outside the yellow-painted brick rowhouse in Port Richmond where it occurred. "It wasn't neglect," said the man, who declined to give his name and said he didn't live in the home, on the 3000 block of Agate Street. "The dogs got out of the … cage," he said, adding that his wife had tried to protect the toddler from the dogs. She was taken to a hospital and later released, he said. Police said the child was 2 years old, but the man said he was 3. He declined to specify his relationship to the boy. Neighbors said the toddler did not live in the home but was visiting. James Garrow, a spokesperson for the Medical Examiner's Office, declined to provide information on the boy, saying the matter was under investigation. Police declined to release the boy's name. Police Commissioner Richard Ross said in a phone interview Thursday that the District Attorney's Office would decide whether charges would be filed. "Everything is still under investigation," Ben Waxman, a spokesperson for the DA's Office, said by email Thursday. Ross said his department's Officer-Involved Shooting Investigation Unit was looking into the death because police fatally shot two of the three dogs that appeared to have attacked the boy. Two other pit bulls were caged during the attack, Ross said. The Animal Care and Control Team of Philadelphia removed all five dogs Wednesday, spokesperson Morgan Polley said. One dog died in the house and another died while being transported to ACCT's facility in Feltonville, she said. On the Port Richmond block Thursday morning, neighbors were still stunned. They said they did not know who lived in the house. It was about 5:15 p.m. Wednesday when police received calls about the attack. Christina Bledsoe, 40, said that before police arrived, she heard a woman screaming outside the home: "They have the baby! They have the baby!" Bledsoe ran over to the woman, whom she didn't know. "They're killing the baby!" the woman said. Bledsoe said the main door of the home was open. She opened the outer door and saw another woman and the child being attacked by pit bulls in the living room. One dog lunged toward the front door, and Bledsoe said she quickly shut the outer door. Other neighbors rushed over to help. Jason Rash, 41, said he ran over to the house and tried to distract the dogs. "I was banging on the door," said Rash, adding that he threw a broomstick, dustpan, and shovel at the dogs. Rash said a woman whom he understood to be the boy's aunt was lying on top of the toddler trying to protect him. She was getting bit, too, he said. Outside their Port Richmond home Thursday, Jennifer Tart and her husband, Jason Rash, recounted the horror Wednesday when pit bulls attacked a toddler in another home on their block. At one point, the aunt came out of the house crying, Rash said. "She left the baby in there," he said. "She thought the baby was gone." When police officers arrived, they opened the outer front door in an attempt to go in, Bledsoe said, but quickly slammed it shut because of the attacking dogs. Then they had to make sure they didn't shoot the child, she said. She said once she heard police shooting through openings between the metal bars in the outer front door, she went back into her house and told her children, ages 8 and 12, to stay inside. From the second-floor window of her home, Bledsoe said, she saw the boy placed into an ambulance. He was pronounced dead at 6:05 p.m. Wednesday at St. Christopher's Hospital for Children. Rash said he didn't know who lived in the home, and said he saw no furniture inside the living room, just five dog cages. He said that besides the aunt who had been on top of the toddler, two other women in their late teens or early 20s had been upstairs at the time of the attack. Police took them into a police vehicle for questioning, he said. According to city property records, a woman named Yuderka Cruz owns the rowhouse where the boy was attacked. When a reporter called a phone number listed for her, a woman answered and said in Spanish that Cruz was unavailable. She said Cruz owns the property but does not live there and rents it out.